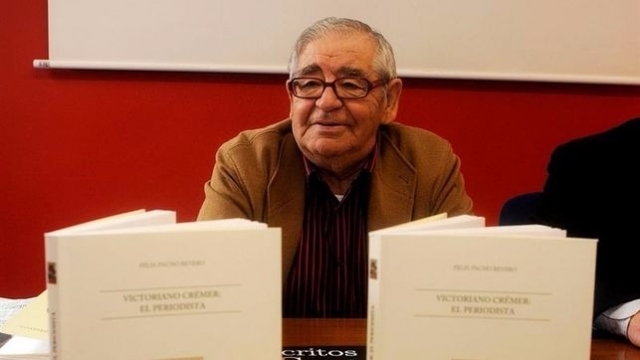 Veteran journalist and writer Felix Reyero Pacho died yesterday afternoon at Clinica During de la Concepción, at 84 years of age, by a heart problem AFFECTED've Suffered in a while. This professional journalist worked in newspapers: such as Provinces, Information, Diario de León or La Cronica de Leon, the Latter founded by himself in 1986.Especially linked to the EFE news agency, the agency've retired, was a great collector and Jacobean all news reports published in the that Were media in which I participated. It was a true expert in the field of the Camino de Santiago, Having devoted Several Important works of his own hand and letters.I is the author of the works 'The good food in the Jacobean Route', 'agustinianas Footprints on the Camino de Santiago' or 'de Compostela Botafumeiro'. Felix was Pacho Reyero regulate at the Association of Madrid, I visited to be aware of the Jacobean news and stay in touch With the pilgrims.